Thanks to a grant from the Michigan Coastal Management Program and the National Oceanic and Atmospheric Administration (NOAA) the SWP in cooperation with the City of Marquette have initiated the first phase of restoring over half a mile of Lake Superior shoreline. 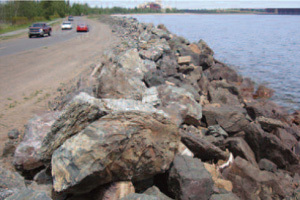 The 3,000 foot section of shoreline targeted for restoration is adjacent to Lakeshore Boulevard and is currently heavily armored with a tall ridge of rock rip-rap that obscures the view of Lake Superior. The city will host several public meetings in 2012 to invite citizen input regarding shoreline restoration design, public access, viewing platforms, road redesign and more. 2013 will include opportunities for volunteers to assist with two small dune restoration demonstration projects. For more information please visit the City of Marquette website: www.mqtcty.org or contact the SWP. 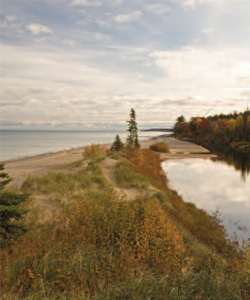 Did you know that less than 10% of the Lake Superior shoreline is made up of sand beach and dunes? Many unique species of plants and animals live in this somewhat rare dune and swale ecosystem. Sadly, many of our most popular Lake Superior dune systems are being impacted from overuse or misuse. Each summer the SWP completes a series of dune restoration projects. Recent projects include McCarty’s Cove in Marquette and the MDOT turn-outs along highway M-28 in Chocolay Township (funded by a FEMA grant). Dune restoration includes beach grass transplanting, native shrub and tree planting, invasive plant removal, fence building, installing signs and more. If you or your community group would like to volunteer to help on a dune restoration project please contact the SWP. 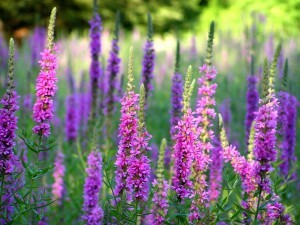 Great Lakes coastal wetlands are rare. The EPA estimates that over 50% of these unique ecosystems have been lost to development. 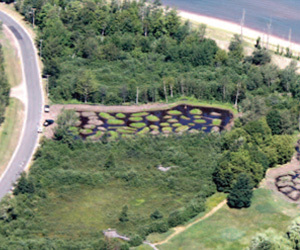 The SWP staff is proud to be working with the City of Marquette in restoring the coastal wetland at Presque Isle Park. The approach to Presque Isle(French for “almost an island”) was once predominately coastal wetlands. Sadly, over the last century most of these wetlands have been filled in with countless tons of soil, concrete rubble and other debris. SWP staff developed the wetland restoration plan that is being used to guide the restoration process at Presque Isle. The good news is that the project will have numerous environmental benefits including improved coastal habitat for a wide variety of migratory birds. The SWP will also be assisting with the ongoing monitoring at the site. Look for additional coastal wetland restoration work in the future! If you would like to volunteer to help with related wetland mon- itoring please contact the city or SWP. SWP plans for the Salmon Trout include; additional habitat restoration projects, expanded stream monitoring and continued public education. The SWP has also been instrumental in improving public access to this unique river system. 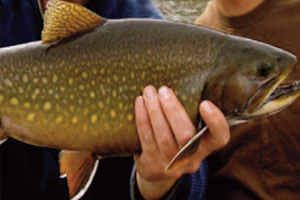 The restored watershed and improved fishery sets the bar higher for everyone truly interested in protecting the long term health of the Salmon Trout River and Lake Superior. Sometimes it’s the most simple, low-cost Shoreviewer projects that get the most attention. The SWP in cooperation with the Marquette County Community Foundation used simple red buckets to raise awareness about runoff pollution, storm drains and reducing cigarette litter on our beaches. Recent smoking ordinances have had the unintended consequence of increasing cigarette litter on our sidewalks and streets. When it rains (or snow melts) thousands of cigarette butts are washed down our storm drains into Lake Superior and wash up on our beaches. 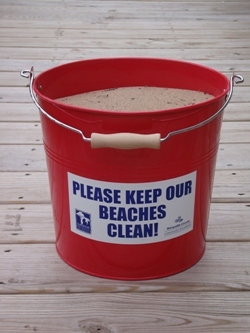 To address the problem the SWP provided businesses with free red buckets filled with beach sand to encourage proper disposal of cigarette butts. Not only did the program dramatically reduce cigarette litter it also raised community awareness about storm water runoff. The red bucket program has since been replicated by other communities an was featured at the EPA Great Lakes beach conference. The SWP also continues to sponsor annual citizen beach clean-up events. If your business or community organization would like more information about these beach programs please contact the SWP. The Superior Watershed Partnership has completed 6 watershed management plans. Click here for a list of other SWP plans. The first step in restoring a watershed is developing a prioritized management plan that is then approved by EPA and the State of Michigan. Thanks to 319 funding through the Clean Water Act the SWP developed a comprehensive plan for the Two Hearted River Watershed. Over the last several years the SWP in cooperation with The Nature Conservancy(TNC) and other local partners has been working to implement the plan by installing a number of large scale restoration projects that control erosion, improve habitat and provide better public access. 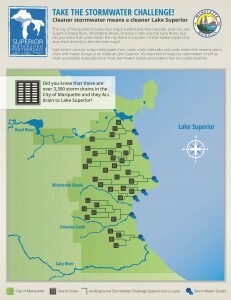 TNC and SWP restoration projects have been funded primarily through the EPA Great Lakes Restoration Initiative (GLRI). To date, four field projects have been installed and more are scheduled. We think Ernest Hemingway, author of “The Big Two Hearted River”, would be pleased. For more information about the projects or to learn about Two Hearted volunteer opportunities please contact the SWP. Thanks to a grant from the Environmental Protection Agency (EPA) the SWP is currently working on a comprehensive assessment of the Carp River Watershed to identify sources of run-off pollution and contamination with an emphasis on mercury sources. The Carp River is listed as a Great Lakes Area of Concern (AOC) due to historic mining and laboratory activities. The good news is that the primary sources of contamination are being addressed through the Great Lakes Restoration Initiative (GLRI) and natural attenuation. The SWP project will also address secondary sources of contamination and will include the cities of Ishpeming, Negaunee and Marquette. Once completed the Carp River AOC assessment will be used to secure grant funding to implement prioritized community pollution prevention projects. For more information on invasive species in the Central UP visit the Lake to Lake Cooperative Invasive Species Management Area (L2L CISMA) website. 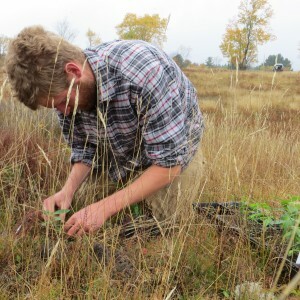 With the help of many project partners, the SWP’s habitat protection and restoration projects have improved the homes of a huge range of native Michigan species, from coastal dune grass to monarch butterflies. 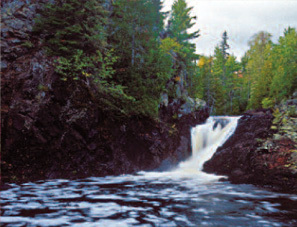 The City of Marquette includes four major watersheds that naturally drain to Lake Superior (Dead River, Whetstone Brook, Orianna Creek, and the Carp River). But did you know that underneath the City there is a system of stormwater pipes that also drain directly to Lake Superior? Each time it rains (or snow melts) water from roads, roofs, sidewalks, and yards enters the nearest storm drain and makes its way to an outlet at the shore of Lake Superior.